Upon seeing her beautiful creations I wanted to buy one! Unfortunately it was not in my budget at the time... so what was I to do? 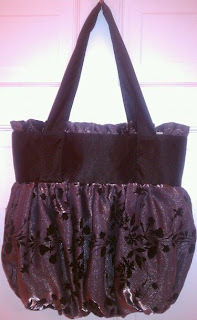 I had 2 skirts in my stash of clothes waiting to be mended and/or refashioned. One was black and the other was a silky silver with black felt-like flowers on it. Sorry didn't even think to snap a photo. I had some purse patterns and decided to give it a try. Of course I wasn't completely in love with the pattern so I tweaked it here and there. And viola! I have a new purse! Awesome job! I love the pattern and the choice of fabrics! Doesn't it feel good to repurpose something into something useful?! And now, you have two less things in your "mending" pile! Bonus points for you!